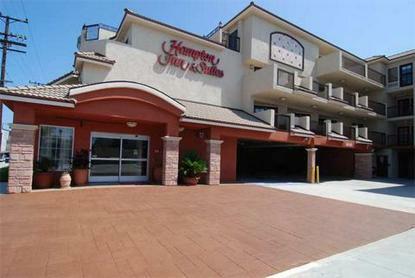 The Hampton Inn & Suites Hermosa Beach is located southwest of Los Angeles. We are half a mile to Hermosa Pier, one and a half mile to Redondo, Manhatten Pier and public beaches. We offer king, king study, double queen, suites and jacuzzi suites, and rooms with balcony. We have a fitness center on premises. Every room has a an iron/ironing board , hair dryer,refrigerator, microwave, coffee maker, cable with HBO, and more than half of our rooms have an ocean view. We have a sun deck on the fourth floor overlooking the ocean and we serve a full continental breakfast with hot items. We are within walking distance to the Pier, restaurants, clubs and beach. We are also only five minutes from the Galleria Mall and only five miles from Los Angeles Int'l Airport. Northrop Grumman, Xerox, Toyota, Nissan, and Hughes are located less than seven miles. All Rooms have FREE HIGH SPEED INTERNET ACEESS AND WIRELESS IN THE LOBBY.